Lie Flat seats. High Speed Trains. 5 star hotels. We did it for a few hundred bucks. When you can use points to fly in comfort…the world suddenly becomes within reach. Even for a weekend. This is the main reason I started the #weekendwarrior series: To illustrate what is possible, within reach, and inspire YOU to Go and See. The. World. Stop making excuses of too little time, money, and the like. You don’t need weeks of vacation to see a wonder of the world, 1000s of dollars to spend, you just need to be smart. Use my site, or (cough, cough) others, and expand your experience. If I can do it, so can you. I got an amazing amount of positive feedback after my weekend to Tokyo trip, and so…I did it again. This time my best friend and I jetted off to Shanghai for a few nights, and then routed back via Hong Kong. I wrote an longer post geared entirely towards the planning, but a quick overview goes like this. AA was offering cheap flights to Shanghai, roughly $330 a piece. At the time I was Executive Platinum and applied 2 System Wide Upgrades to our tickets which cleared a couple days in advance of flying. We knew we’d use points to stay the majority of the nights. Ultimately, we ended up paying for just one night at the Intercontinental Shanghai. All of the others were paid with points or free night certificates we had from holding credit cards. In order to get back from Shanghai, I really wanted to be able to fly in first with Dave. We’d done it before from Tokyo on Japan First, and had an absolute blast. I had a bevy of Alaska miles and Dave was sitting pretty with Amex points – this brought Cathay to mind. As luck would have it, I searched via BA and found 1 seat in First back from Hong Kong, and also found a connecting flight from Shanghai. Since Alaska is the most restrictive, I used my points to lock it up. We were fortunate that another seat released and Dave transferred points from Amex to Asia miles to lock his seat down. Don’t have an American Express? Learn more about these attractive welcome offers. 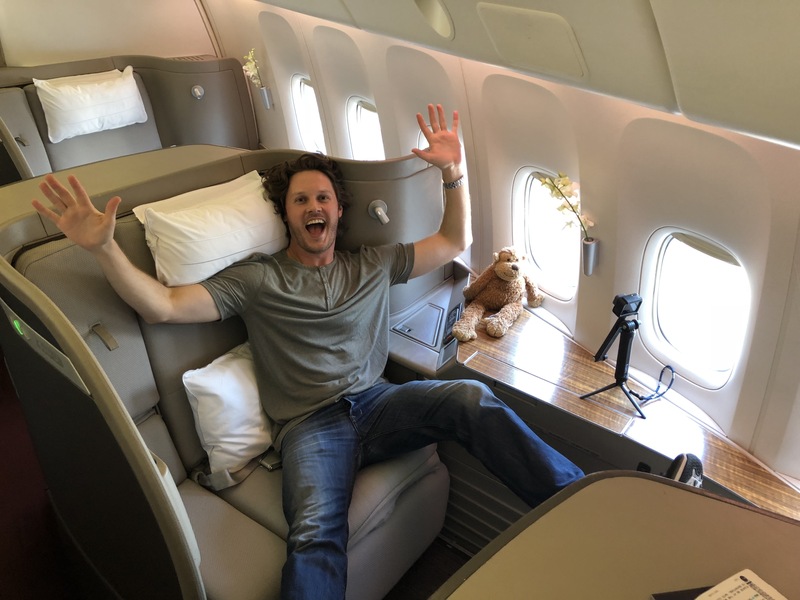 We flew AA Business Class on the 787-8 from Chicago to Shanghai in the mini cabin after my SWUs cleared. This set us back $330 ( I used Amex Points to book mine, roughly 20k). The reason I opted for this approach was how Amex flight ultimately code when credited to Alaska: I earned a mile for every mile flown. Originally we had planned to stay at the Intercontinental for 2 nights, and the Andaz for 1. I had a BOGO from Ambassador status, but it failed to arrive prior to departure. We flipped the nights around and stayed the first two at the Andaz, and the final night at the Intercontinental. We left Friday, came back on Wednesday, and had an unbelievable weekend. You’re gone for such a short amount of time that you never adjust to the new time zone. In fact, because it’s so exciting, our adrenaline just pushed us through. And who wouldn’t be absolutely stoked to grab a drink on top of the world at Ozone in the Ritz Carlton Hong Kong. B to the YAH! Did you get distance-based earning booking AA flights via Amex Travel rather than fare-based? I often see AA reservations via Amex Travel coded into ‘Method: Fare’ as direct bookings. Thanks for the catch – I updated!